Michael Kerker has been Director of Musical Theatre for ASCAP (American Society of Composers, Authors and Publishers) since 1990. He is also the co-producer, with Michael Feinstein, of a series of concerts at Carnegie Hall that focus on the Great American Songbook and producer of a series of interview programs entitled, "Broadway: Up Close and Personal," for the Kennedy Center. His interview guests have included Broadway legends Jerry Herman, Alan and Marilyn Bergman, Charles Strouse, Sheldon Harnick, Marvin Hamlisch and Stephen Schwartz. Under the ASCAP Foundation banner, he is the founder of the Jerry Herman Legacy Program, a series of seminars, master classes and concerts for high school students presented across the nation that features the legendary composer/lyricist. And, he is a member of the Steering Committee of Manhattan School of Music’s Musical Theatre Artistic Advisory Committee. Stay Thirsty Magazine was fortunate to catch up with the very busy Michael Kerker for these Five Questions in-between his many projects in New York City. STAY THIRSTY: How did your Carnegie Hall Concerts collaboration with Michael Feinstein come about and what is the underlying mission of this project? MICHAEL KERKER: About 15 years ago, Michael Feinstein was in the audience for a concert I produced for ASCAP at UCLA. The evening was a tribute to the legendary songwriter (and ASCAP member) Johnny Mercer and it featured several guest singers. Michael was about to launch a series of three concerts annually at the newly opened Zankell Auditorium at Carnegie Hall. Michael realized that it would take a great deal of work on his part to develop new concepts for three concerts every year. We both realized it would be advantageous to combine ASCAP's interest in helping to promote the catalog of our members who contributed to the Great American Songbook and Michael Feinstein's well-known life's work as "keeper of the flames" of these great American songwriters. Clearly helping to keep alive this great cultural asset of America, the Great American Songbook – which I consider to be one of America's best ambassadors around the world – is a mutual goal that Michael Feinstein and I share. So for each of Michael's concerts he and I select a great songwriter to salute. I'll select the guest artists – help them to select appropriate songs to perform – and Michael will fill out the evening with his selections. Most recently we paid tribute to Harold Arlen. I'm happy to say that our collaboration is in its 15th year! STAY THIRSTY: Why did you create your “Broadway: Up Close and Personal” interview program at the Kennedy Center? What was your goal and what have been some of the most outstanding moments during its history? 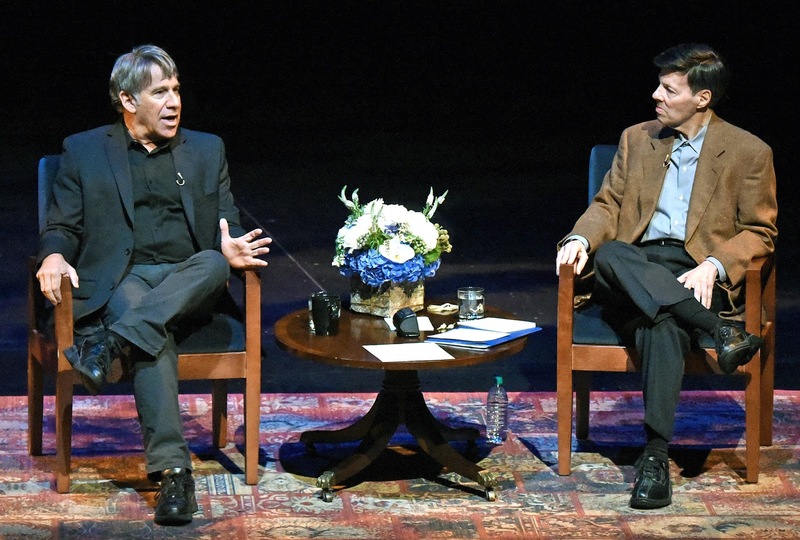 MICHAEL KERKER: The Kennedy Center always had a series of onstage conversations with American cultural figures. It seemed that none of these events included composers of the American Theatre. The head of the educational department at the Kennedy Center, Virginia Rogers, called me one day (still not certain how she heard about my work at ASCAP as head of Musical Theatre) and she asked if I could bring some of the leading composers of the American Musical to the Kennedy Center for a series of talks. She also wanted to be certain we included musical selections in addition to the interview. We brought some of these programs to local schools in the area and then presented the same program on stage at the Kennedy Center. The goal for the program was to help educate students on the process of creating musicals and hopefully inspire future writers and performers of this art form. Not sure I can point to any one songwriter who participated in these events as a special highlight for me – how can one choose when I had the honor to interview and work with such legends as Jerry Herman, Stephen Schwartz, Alan and Marilyn Bergman, Charles Strouse, Marvin Hamlisch and Sheldon Harnick. STAY THIRSTY: How does the ASCAP Musical Theatre Workshop program work and who are the intended beneficiaries? Has this program been a major factor in the careers of some of your musical theatre students? MICHAEL KERKER: For 20 years,the ASCAP Musical Theatre Workshop has been under the leadership of the iconic composer Stephen Schwartz (Wicked, Pippin, Godspell, Pocahontas, Enchanted, etc.). We hold the workshops on an annual basis in New York and in Los Angeles. I solicit musicals every year and we usually receive about 100 projects. While most of the applications are from the U.S., we often receive works from Australia, Israel, England and Italy. Writers are asked to submit four songs from their musical, copies of the lyrics for each of those songs, a brief synopsis of the book, and some biographical information. We usually select about four projects to participate in each workshop. In the workshop itself, the writers have to present 45 to 50 consecutive minutes of their musicals – book and songs. Actors are on book at music stands – there are no costumes, sets, props or dance. composers, directors, librettists and producers such as Lynn Ahrens, Stephen Flaherty, Marsha Norman, Kevin McCollum and Stephen Sondheim. The invited audience is mainly comprised of the applicants who did not get accepted to the workshop, but are invited to audit. In my experience and from feedback I get from these auditors, they find the panel discussion while specific to the musical that was presented extremely helpful to their own musicals. Over the years, so many young writers who were participants in the ASCAP Musical Theatre Workshop have gone on to have hugely successful careers. Among those writers are: Glenn Slater (School of Rock, Sister Act), Matt Sklar (Elf, The Wedding Singer), Chad Beguelin (Aladdin), Steven Lutvak (Gentlemen's Guide to Love and Murder), Marcy Heisler and Zina Goldrich (Ever After) and Andrew Lippa (The Addams Family). STAY THIRSTY: You have taken the ASCAP Jerry Herman Legacy Program that features seminars, master classes and concerts across the nation. As you reflect back on this project, how has it evolved over the years and what lies ahead in the coming years? 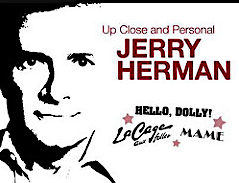 How do you think Jerry Herman would evaluate your efforts? MICHAEL KERKER: In the year 2000, I received a call from a high school teacher in St. George, Utah, who asked if I could bring a celebrated composer to Utah to talk with 1000 students who were to have a conference on the American Musical. This teacher was also hopeful we could include a concert and a master class in our visit. We decided to bring Jerry Herman as the students were very familiar with his work especially Hello, Dolly! and Mame. The goal was to have the students get a better understanding of how musicals are created from both the composers’ contribution and the performers. The performers we brought were all favorites of Jerry Herman – Karen Morrow, Jason Graae, Paige O’Hara. We weren't sure what the response from high school students would be but to quote Jerry Herman, "I feel like I am at my own rock concert." The response was extraordinary. A few weeks later, Jerry asked me if he thought other high schools and colleges around the country might be interested in hosting such a program. I contacted the University of Miami because that was Jerry's alma mater. I received a "yes" from the university almost immediately. After we brought our program there I started to receive invitations from many schools – clearly all word of mouth. Over the next 10 years, we visited three schools annually in such cites as Savannah, Chicago, San Diego and Sundance. After a few years layoff, because Jerry did not want to travel so much any more, we restructured the program. In 2015, I began to offer a Jerry Herman Broadway Legacy Concert to symphony orchestras across the country. Interest was almost immediate and as of 2016, we have presented three concerts annually featuring Broadway performers such as Ron Raines, Debbie Gravitte, Jason Graae and Klea Blackhurst. There is also an educational component to these concerts. In each city we hold a master class at a local university and students come prepared to sing a Jerry Herman song. The classes are led by the performing artists. We select two young students – a boy and a girl – and they get to sing a Jerry Herman song on stage with the symphony orchestra. They are each presented with a $1,000 scholarship in Jerry Herman's name. I know that Jerry is extremely proud of this new series which honors his extraordinary gifts as a giant of the American Musical Theatre. STAY THIRSTY: In your role on the Manhattan School of Music (MSM) Artistic Advisory Committee, how important is it for students to learn about the work of ASCAP and the other institutions, like the American Theatre Wing? MICHAEL KERKER: There is no question that the students at the Manhattan School of Music would gain unique insights into the process that goes into the creation of a musical. As future artists who aspire to perform from the great canon of the American Musical much can be gained from observing the creative process that is on view in the ASCAP Musical Theatre Workshop. Attending our unique concerts at Carnegie Hall can help educate students on the history of the legendary composers of the past. Our Kennedy Center series of Up Close and Personal onstage conversations also gives students a chance to hear the backstories to many of the theatre songs they will be performing in the future. These conversations are still available on the Kennedy Center website. I hope that students at MSM will take advantage of the many opportunities ASCAP can offer them.